Will Bongbong Abandon Fight Against Robredo For New Position in Duterte's Cabinet? Home News & Analysis Asia Will Bongbong Abandon Fight Against Robredo For New Position in Duterte’s Cabinet? Will Bongbong Abandon Fight Against Robredo For New Position in Duterte’s Cabinet? Former Senator Ferdinand “Bongbong” Marcos Jr., son of the late Ferdinand Marcos and long-time ally of President Rodrigo Duterte, is reportedly now looking to a possible appointment as the chief of the Department of the Interior and Local Government (DILG) in the Philippines. The incumbent, Secretary Ismael “Mike” Sueno, has taken no offense to the news of his possible replacement by Bongbong as the Interior Secretary in the Cabinet. “We serve at the pleasure of the President…….it is within his power, wisdom, and discretion to appoint members of his Cabinet. With the information being floated about the change at the helm of the DILG, I take no offense whatsoever,” Sueno said in a public statement. Bongbong’s possible appointment as head of the Department of the Interior and Local Government (DILG) isn’t good news for Vice President Leni Robredo. Robredo had defeated Marcos with only around 263,000 votes during the May 2016 vice presidential election. Bongbong, who believed himself to be the rightful winner of the vice presidency of Philippines, has been pursuing legal action to claim the position for himself over the past nine months. 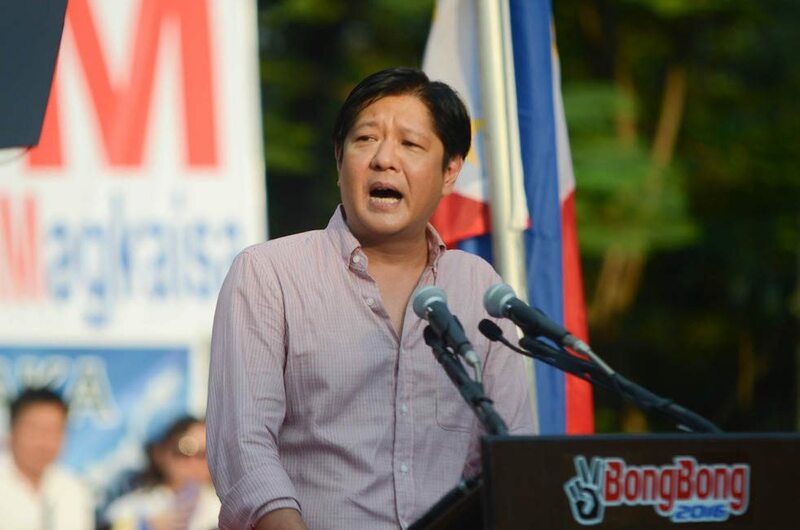 Read, Is Bongbong Now One Step Closer To Becoming Vice President After 8 Month War? Although Robredo had asked the court to reject his petition for a recount, a January 24th ruling said that the court found Bongbong’s petition “sufficient in form and substance”. In early February news began to surface of President Rodrigo Duterte being willing to appoint Bongbong as the chief of the DILG. The DILG is the executive department of the Philippine government responsible for promoting peace and order, ensuring public safety and strengthening the government’s capability delivery services to the citizenry. Since the DILG offers the opportunity to engage all local government units, local chief executives, and officials of local government units, Robredo is worried it may give the Marcos family “an opportunity to do what they did before.” Robredo debated further, “my concern here is that the Marcoses have not paid for what they did to the country.” The Marcos’ family is estimated to be worth between $5 billion to $10 billion. The Presidential Commission on Good Governance (PCGG) has recovered nearly $3.6 billion in the last 30 years. 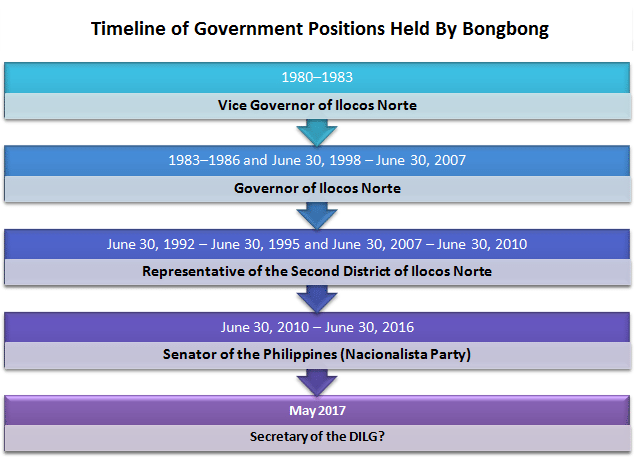 Despite recent developments, Bongbong, cannot legally assume a new government office until mid-2017 as the Philippine law forbids the appointment of a losing candidate to any cabinet post less than one year after the election. Leads us to wonder, will Bongbong abandon his attack on vice presidency and become Duterte’s DILG?